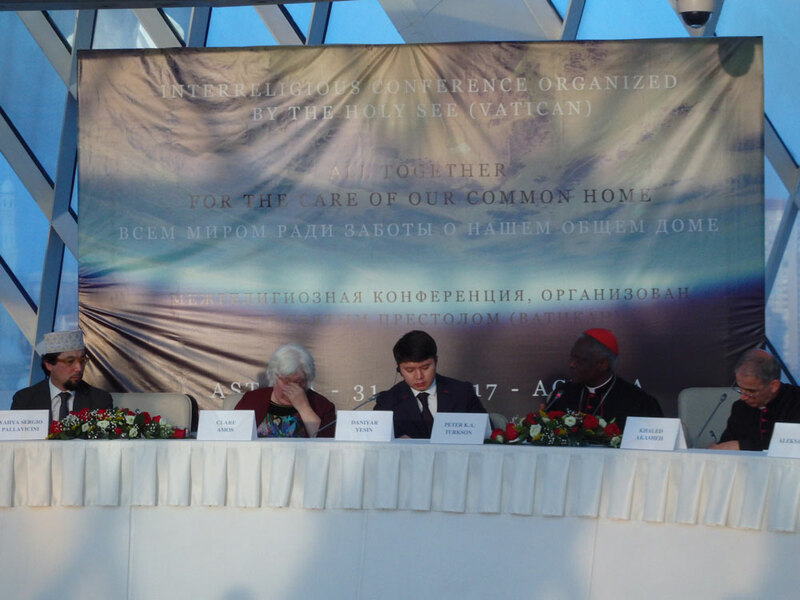 The following statement on “Future Energy” was signed at the interreligious event “All Together for the Care of Our Common Home,” on August 31, 2017. Numerous interreligious statements and gatherings, addressing various aspects of the care of our “common home”, such as climate, water, oceans and forests have been issued in recent years. These initiatives inspire us and many others, demonstrating that, religions and spirituality can give rise to a strong motivation to commit into concrete action in favor of our common home, in favor of the whole human family. They also remind us that religious values and moral obligations – such as not harming others, having a meaningful existence, solidarity, being fair and just – must shape, in a particular manner, the thoughts and the deeds of all believers – be they politicians or public servants, scientists, investors, entrepreneurs, opinion makers, farmers, teachers, voters, parents or artists – towards increased awareness and the urgency of better care of nature, but also better care of our brothers and sisters, especially the needy, the most vulnerable, whose surrounding environment has been degraded and irresponsibly exploited. Finally, these initiatives also highlight how religious leaders and believers can collaborate – at international, national, local level – with public authorities, scientific bodies, schools and civil society organizations in promoting the common good, harmony, benevolence and peace. Today, we religious leaders of different faith traditions, are in Astana to address the challenging topic of “Future Energy”. Indeed, the way energy is generated, transported and consumed is having and will have in the future a significant impact: on nature and ecosystems and thus on access to water and food; on the sustainability of societies, trade and economies; urban and rural areas, as well as oceans; income equity and access to opportunities; human health and wellbeing and, more broadly, human development; conflicts and peace; the effectiveness of international and regional efforts to establish a multilateral governance in order to manage the most complex challenges that affect our common home. This being said, we recall that energy resources are not created by humans: no one may claim any merit or pride for their existence; no grabbing behaviors are acceptable. These resources have been entrusted by God, the Creator, to us for the wellbeing of the entire human family, for all generations. Therefore, these resources shall not be used indiscriminately. In each context and era, human societies must use the available energy resources only after a careful discernment, examining possible alternatives, assessing the needs, treasuring the information provided by scientist and technicians. We are facing complex situations, characterized by a variety of energy resources and systems, which are at various degrees polluting or clean, more or less easy to control and distribute, renewable or not, object of diverging particular interests. The aforementioned discernment must be inspired by the pursuit of the common good of the whole human family and by the respect for the inalienable human dignity. What is at stake is the meaning of our presence on Earth. 1. We encourage all believers and persons of good will to nurture ongoing reflection on shared values and on humans’ relation with nature. This reflection goes hand in hand with contemplation of nature, and with the feelings that come from that contemplation: wonder, humility, gratitude for the marvels created by God, rejecting the idea that our common home is the result of a meaningless, pure chance. The observation of ecosystems, of human nature and of the whole creation leads to many lessons and wisdom, to an adequate anthropology and a valid ethical framework. This allows us to understand more precisely our place and our role in the whole cosmos, our duties of caring and respecting creation, or natural orientation towards relationality, sharing and solidarity, the recognition that we are limited and have limits to respect. Parents have a primary role in guiding their children towards contemplation; however, school, religious education and celebrations as well as media can certainly make a positive contribution. 2. We recall the very special place that various natural resources – including resources linked to energy, such as the fire and the flame, the incense, and water – have in many religious traditions, liturgies, texts and celebrations. Natural elements are inspiration and means which can help in linking us with the Transcendent. In many Faiths and religious traditions, even very ancient, energy is an attribute of divinity, of mighty power and capacity of creation. Hence, it is fundamental to meditate on the significance and relevance of energy resources, and on the fact that humans can use energy for good purposes as well as bad ones, being tempted to trespass limits that shall not be infringed in the fields of human rights, sustainability, bioethics, among others. 3. We recognize that access to energy is a pre-requisite for the fulfillment of many human rights and for the development of persons and communities. Consequently, we call for policies, funding and an effective transfer of technologies and capacities wherever needed, ensuring that, in any context where humans settle, there be access to energy which is clean, safe, reliable and affordable, with the lowest possible negative environmental impact, consistent with local culture, needs and with the related maintenance and governance capacities. While recalling the moral imperative of not harming others, we support an ambitious transition towards non-polluting energy sources and processes, and a reduced dependency from fossil fuels. Such transition must go hand in hand with decentralization and democratization of energy production and access. We suggest that believers and persons of good will should divest from any venture, including energy related-ones, which are not consistent with genuine human and religious values, or, where possible, to challenge the companies and funds in which they invest in order to improve their environmental and social conduct and performance indicators. 4. We appeal to States to reject any large-scale energy project if its environmental and social impacts have not been adequately assessed and the alternative of smaller scale installations using renewable energies not carefully and fully examined, to oppose corruption while always safeguarding the dignity and the rights and the involvement of local inhabitants. The principle of reparative justice, which can be framed as the “polluter pays and restores the situation” shall be applied, always respecting local inhabitants. cynical speculation on energy resources. any unnecessary dependence on networks, trade agreements, patents or bureaucracy which could hamper a decentralization and democratization of energy in particular the access to energy of the poorest and most isolated – in accordance with the goals of the United Nations Sustainable Energy for All by 2030. 7. We appeal to the business sector as well as to all consumers, not to be led by the mere search for higher short-term profit and for increased consumption levels, and especially to refrain from the massive promotion and production of short-life products demanding a lot of energy for their production and use which are soon outdated or broken and need to be replaced by newer ones, thus reinforcing an unsustainable culture of waste and unbridled consumerism. Long-life products should be preferred, especially when they match high standards in the fields of environmental protection, equal redistribution of earnings, social inclusion, human rights. 8. We reject the production and use of nuclear bombs, and more broadly we are saddened by the amount of energy and natural resources being used to produce and use weapons. 9. We appeal to our religious agents, to the administrators and users of religious buildings including facilities used for training or housing, to improve – where appropriate, while respecting artistic, insulation and safety requirements – the energy consumption patterns of these buildings, as far as possible using energy locally produced from renewable sources, to carefully choose their suppliers, to encourage recycling, water saving and, wherever possible, composting and recycling of wastes. 10. We recommend observance of the various fasting times and increased frugality as prescribed by our respective sacred texts or traditions, not as a mere procedure or as fashion trends, but as an ever-renewed opportunity and privileged moment for personal meditation, prayer and closer relation to God, which can also encompass meditation about the relationship with the others and with other lifeforms. More broadly, a rich spiritual life, nourished by prayer, can provide the motivation needed for change and progress, and commitment for facing problems, having identified their real causes, instead of merely addressing symptoms. 11. We encourage religious leaders in every nation to work together with other sectors of the society, including Governments and policy-makers, in order to shape Future Energy systems really at the service of the whole human family. At the same time, we encourage Governments, policy-makers and business sector to consider positively the particular contribution of religions.